The Walking Dead Volume 1, DAYS GONE BYE is a great read. It’s a trade paperback that houses the first six issues of the series. The Walking Dead, published by Image Comics, follows the day-to-day lives of survivors of an apocalypse. ZOMBIE APOCALYPSE. Rick Grimes woke from a coma to find the hospital full of zombies. Making his way home through the deserted town, he meets Morgan Jones and his son, Duane. Rick learned that zombies had taken over and everyone was told to relocate to larger cities, where they would receive protection from the government. Rick left to head to Atlanta where his in-laws lived, in hopes of finding his wife and son. Rick encountered zombies along the way, but he safely made it to a campsite in the woods outside the city of Atlanta. There he met up with his wife, Lori and their son, Carl. The group worked hard at protecting each other, although zombies got ahold to a couple of people in the group. The Walking Dead is a story about survival. It’s a story about trust. Glen sneaks in and out of the city to get food and supplies for the rest of the group. He only goes a certain distance once in the city, and knows which buildings to stay away from. Stress, jealousy and mistrust leads to a fallout between Rick and his friend Shane. 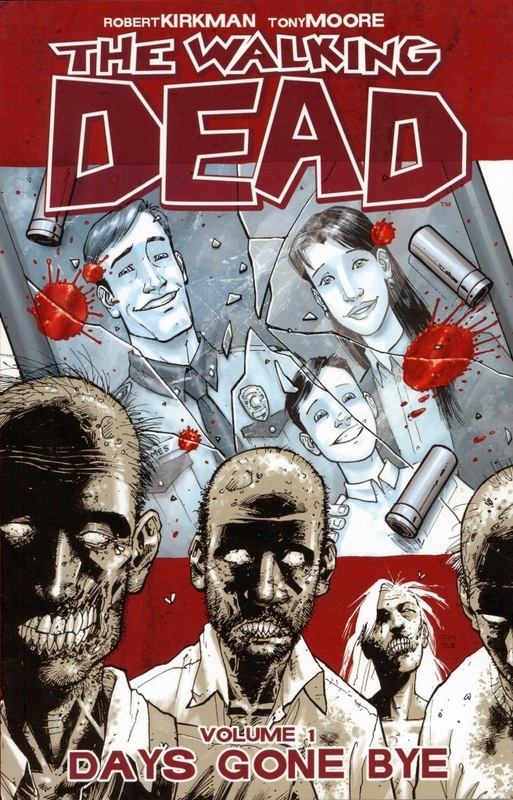 Robert Kirkman did an excellent job at setting up the story in this volume. Well written dialogue. Perfect timing. Tony Moore produced some great art in this book. It’s black-and-white. It fits the story perfectly. Visually sets the tone. Eerie. Creepy. And guess what? I love it. There is no doubt that I highly recommend everyone, that’s not afraid of this genre, to read The Walking Dead. So far I’ve only read the first six issues and the cause has not been revealed. However I do plan to read until I’m caught up to the current issue. I’ll be sure to post more on it soon. I’m sorry I don’t have an answer, but thanks for asking!